20 Научно-практическая конференция "Традиционная культура тюркских народов: проблемы и перспективы"
Можете написать национальность следующих глав Чув. АСССР? Edit any article or your user page in VisualEditor by clicking on the new "Тӳрлет" tab at the top of the page. See the mw:Help:VisualEditor/User guide for information on how to use VisualEditor. Now, when you press the "Тӳрлет" button to edit an article, you will get the new VisualEditor software. 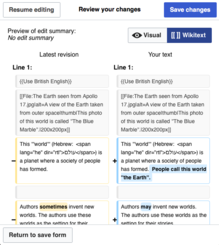 To use the wikitext editor, you can press "Кодне тӳрлет". (After the deployment, everyone will automatically have the option to use either VisualEditor or the current wikitext editor.) For more information about how to use VisualEditor, see mw:Help:VisualEditor/User guide. 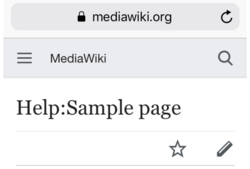 As some of you have noticed, this Wikipedia now has Визуальный редактор (VisualEditor or "VE") enabled for all users. There are now two tabs for editing: "Тӳрлет" and "Кодне тӳрлет". Click "Тӳрлет" to use VisualEditor. 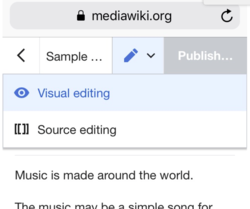 Click "Кодне тӳрлет" to edit using wikitext markup. 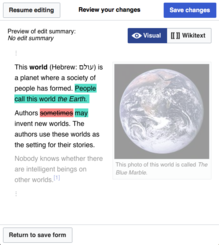 You will soon be able to switch from the wikitext to the visual editor after you start editing. (T49779) Previously, you could only switch from the visual editor to the wikitext editor. Bi-directional switching will make possible a single edit tab. (T102398) This project will combine the "Тӳрлет" and "Кодне тӳрлет" tabs into a single "Тӳрлет" tab, similar to the system already used on the mobile website. The "Тӳрлет" tab will open whichever editing environment you used last time. The single edit tab project will combine the "Тӳрлет" and "Кодне тӳрлет" tabs into a single "Тӳрлет" tab, like the system already used on the mobile website. (T102398, T58337) Initially, the "Тӳрлет" tab will open whichever editing environment you used last time. Your last editing choice will be stored as a cookie for logged-out users and as an account preference for logged-in editors. Logged-in editors will be able to set a default editor in the Тӳрлетни tab of Special:Preferences in the drop-down menu about "Режим редактирования:". The single edit tab feature combines the "Тӳрлет" and "Кодне тӳрлет" tabs into a single "Тӳрлет" tab. It has been deployed to several Wikipedias, including Hungarian, Polish, English and Japanese Wikipedias, as well as to all Wikivoyages. At these wikis, you can change your settings for this feature in the "Тӳрлетни" tab of Special:Preferences. The team is now reviewing the feedback and considering ways to improve the design before rolling it out to more people. The "Страницăна çырса хур" button will say "Создать страницу". This will affect both the visual and wikitext editing systems. More information is available on Meta. The "Save" button now says "Save page" when you create a page, and "Save changes" when you change an existing page. In the future, the "Страницăна çырса хур" button will say "Создать страницу". This will affect both the visual and wikitext editing systems. More information is available on Meta.